By choosing a preferred modular sign system and using it regularly, you and your team will work more efficiently, lower your labor costs, make effective use of inventory, and begin to recognize potential applications for a variety of different projects. You’ll save time and increase your chances for additional sales. Familiarizing you and your team with a modular sign system means you won’t have to start from scratch each time a new buyer requests signage. These customers will welcome faster turnaround times along with the flexibility of modular sign systems, and you’ll become a valuable resource when they later need coordinated signs to update or add to their original order. SLATZ® is Clarke’s proprietary modular sign system. Together with SLATZ Capture®, its insert-holding twin system, they offer a vast range of applications and solutions for your customers. Better yet, they are ADA adaptable and available in a wide assortment of standard and custom colors. They can even be double-sided projecting or ceiling suspended for maximum visibility. The configurations are truly limitless! Get creative! Customize the basic components of aluminum extrusions and acrylic mounting clips into a new look for each customer. Mix and match sizes and shapes as well as color combinations. Coordinate messaging and images. Most importantly, highlight their logos and branding elements. The mounting process makes SLATZ tamper resistant. Replacements and updates are quick and easy to produce. A modular sign system lets the end user take charge of change, from switching out the names of employees in cubicles to the relocation of entire departments. 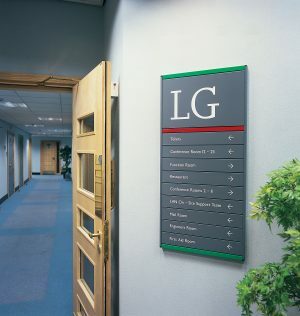 Corporate signage standards can be maintained as new locations or facilities are opened anywhere in the world. SLATZ Capture is a flat-profile, modular sign system designed to hold paper or other flexible graphic inserts with a clear acrylic lens. Another option is the use of a rigid material up to 1/16” thick (acrylic, engraving stock, photopolymer, or zinc, etc.) without a lens. Both the rigid material and the clear acrylic lens can be modified to meet ADA requirements for Grade 2 Braille and raised copy. Read what sign industry professionals, including Clarke Systems President Charlie Kelly, have to say about Electronic Wayfinding Signs in the October 2017 issue of Sign & Digital Graphics Magazine.